Can't make it to London for Prince Harry and Meghan Markle's wedding festivities? One D.C. hotel wants to give you the royal treatment. WASHINGTON — If you love the British royal family but can’t make it across the pond to join in the festivities for Prince Harry and Meghan Markle’s wedding, one D.C. hotel wants to give you the royal treatment. 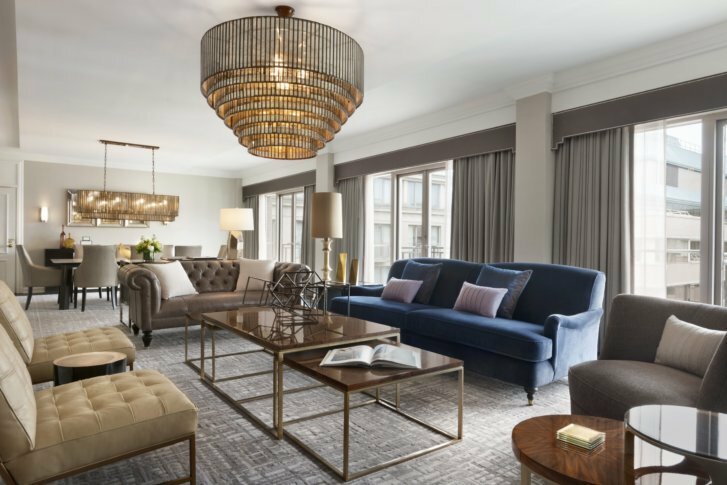 The Fairmont in D.C. is offering one couple and two dogs (inspired by Queen Elizabeth II’s love of corgis) to experience a two-night “Royal Wedding Guest Package,” with the guests taking up residence on the Fairmont Gold Floor in the Royal Suite. So, what’s the price of feeling like a prince or princess? A cool $75,000. The package includes first-class, round-trip airfare from anywhere in the U.S. After arriving at the airport, a chauffeured Range Rover — the car of choice for many royals — will bring the couple and their pets to the Fairmont. When the guests arrive at the hotel, they will be greeted by two men dressed as the Queen’s Guards and escorted to their suite. A butler, who will be on hand around the clock, will then present a high afternoon tea, which will include Champagne and caviar. “It was very much a collaborative effort with our team here at Fairmont, but all the Fairmont hotels throughout the United States and Canada are also putting together fun events and packages for the royal wedding,” said Diana Bulger, public relations director at the Fairmont, Georgetown. A personal photographer will accompany the couple throughout their stay to capture the moments of their visit, Bulger said. A Fortnum & Mason “Fit for Your ‘Queen’” hamper. Meghan Markle’s favorite flowers — peonies — arranged in the suite. Two Barbour classic jackets, a favorite of the royal family. A $10,000 gift certificate for a shopping spree at Burberry. The guests will also receive an official invitation to the Fairmont’s Royal Garden Party on Saturday, May 19 — also open to members of the public — to watch the ceremony while enjoying Pimm’s and slices of wedding cake. You could even be fooled into thinking that members of the royal family decided not to go to the wedding in Windsor after all, as royal look-alikes will mingle with guests for photo opportunities. The package is available on May 18 and 19. The Fairmont is located at 2401 M St. in Northwest D.C.